A simple divorce separation agreement can make the difference between a smooth ride and a tortuous one while waiting for a divorce. A properly drafted agreement identifies each spouse's responsibilities concerning the ongoing business of the marriage and protects the marital assets while the couple wades through the divorce process. Without it, expectations are often murky at best. However, with a little cooperation from both parties, a divorcing couple can draft a simple separation agreement that protects both their interests and maybe even preserves a little of the good will between them. A divorce separation agreement is a contract entered into by a husband and wife that spells out how the couple will handle their family responsibilities while the divorce is pending. A simple divorce separation agreement addresses only basic issues of living arrangements, division of property, financial responsibility, marital support, as well as child custody and support if the couple has minor children in common. The details are saved for the property settlement agreement and parenting plan drafted during the divorce process. The first section of the agreement should identify the husband and wife by name, include their current addresses, provide the original date of marriage, state that the couple is separating and name the date of separation. The agreement should clearly state that the couple intends to live apart -- and that this agreement is intended to document how they will maintain the responsibilities of their marriage while their divorce is pending. The agreement should also address the rights of the spouses while the divorce is pending. The purpose of this is to prevent either spouse from holding conduct specifically permitted in the rights section against the other during the divorce process. It also sets boundaries for contact between the spouses. A basic statement of rights includes the right to live separately, the right to date others, and the right to enter into contracts and purchases independently. It should also state that each spouse has the right to live free of interference from the other, and to expect any contact to be prearranged and mutually agreed upon. If the couple owns the marital residence, the agreement should specify which spouse retains use and possession of that residence and if the mortgage is to be paid jointly, or by only one spouse. The agreement should designate which spouse takes what property and any associated debt. The agreement should state that any property not addressed in the agreement remains frozen until property division is addressed during the divorce, to keep either spouse from selling and/or hiding assets. If one spouse's employment provides health insurance, the agreement should preserve that arrangement or indicate that each spouse agrees to maintain his own insurance. If the spouses agree that one will pay the other spousal support, the agreement should document the amount and frequency of payments. Alternatively, the agreement may call for one lump sum payment due at signing of the agreement, or a finite sum payable over a specified number of months. If the couple has minor children together, the agreement should designate one parent as residential custodian and set a visitation schedule for the other. Decision-making authority should be spelled-out, whether it is divided jointly, or vested in only one parent. The non-custodial parent's monthly child support obligation should be detailed, along with responsibility for the children's insurance and any school tuition. Even a simple agreement should address inheritance rights. The agreement should specify that each spouse relinquishes any right to inherit any part of the other's estate under any past, current or future will. In the absence of a will, each spouse should relinquish the right to inherit any part of the other's estate under their state's laws of intestate succession, or the statutory distribution of property in the absence of a will. The agreement should include the state and county where the parties enter into the agreement along with the current date, followed by signature lines for both spouses. 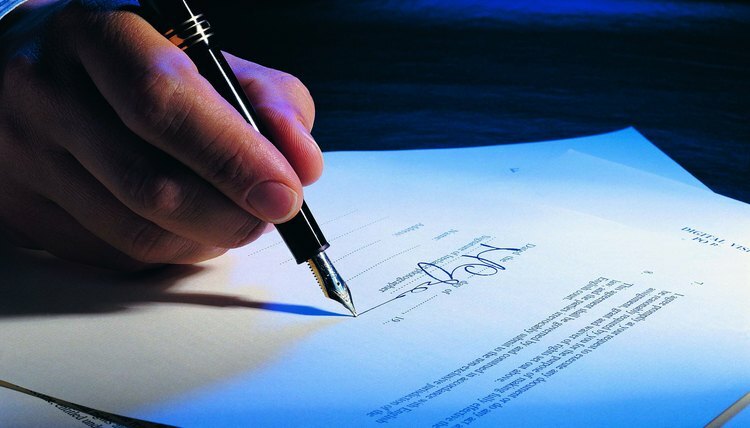 Witness signature lines should be provided if the laws of the state where the agreement is executed require witnesses. A notary public's verification statement and space for her stamp should conclude the document.